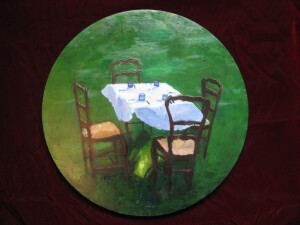 A round painting, or “tondo”, always attracts my interest. Whe I see a round painting in a gallery or a museum I go up and check it out first. I’m surprised there are not more of them out there. Actually the term “tondo” is from the Renaissance, and refers to larger round paintings or sculptures. My painting technically would not qualify since its diameter is only about 16 inches, or about 41 centimeters. The photograph is rectangular because the painting is photographed against a red velvet cloth. This was painted from a table setting done by my children. I have to say that I bought this round canvas well before I knew what I was going to do with it. When my children set this little table, in Orange, Connectucut, I knew I would use if for this painting. The juxtabposition of the square within the circle is one thing that made my decision. We as a family were all about to sit down at this little square table, and enter the family circle, “The Circle of Trust”, as Robert De Niro points out in “Meet the Parents”. The afternoon sunset on the grass made me sad, as it always does. My children were much younger when they set this table. Those days are gone, but I’m thankful for the children they’ve become and the adults they will be. This Thanksgiving weekend I’m thankful to have been able to share the pictures and stories on this website with you over the past eleven months.